This convoluted 3 Foam eggcrate cushion measures 18 x 16. It provides support and pressure relief. The convoluted foam improves weight distribution and air circulation. 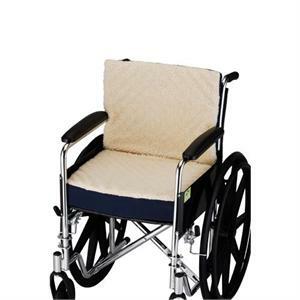 It has a removable cover that is a machine washable polyester/cotton with a fleece topping for added comfort, as well as a 3" seat cushion with connected 2" thick back, which fits most chairs and wheelchairs. The weight capacity for this cushion is 250 lbs.